or even know what's in them? 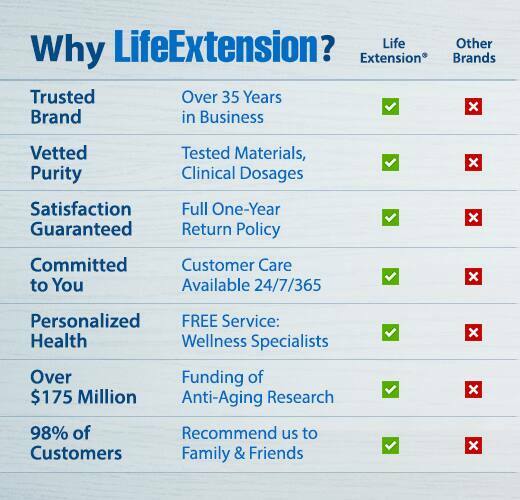 Life Extension has been helping people stay healthy and live better for more than 35 years. Our belief in a scientific approach to better nutrition has always been the cornerstone of our company. But we also believe that good health is a balance — and suspect that you do, too. Regular exercise, smart lifestyle choices, and a sensible diet are the keys to living a healthy life. But getting the right vitamins, minerals, and other nutrients—at the optimal levels for your body needs to thrive—isn't easy. That's why it's a good idea to use nutritional supplements to augment even the healthiest diets. The problem is, how do you choose the very best nutritional supplements … or even know what's in them? How do you know that they've been thoroughly researched with clinically validated dosages? With all of the supplement brands out there — some good, some not so good — how can you be absolutely certain you're making the best choice? The answer is simple: always choose Life Extension®. Just like with the foods you eat, the quality, purity, and potency of the ingredients that go into your nutritional supplements really do matter. That's why at Life Extension, we've been committed to sourcing the highest quality raw materials, and creating the best supplements money can buy, since 1980. Today, we make over 350 vitamins and nutritional supplements that set the gold standard for supporting weight loss, heart, brain, bone, joint, eye, skin, sexual health, and so much more. And we base these formulas on the latest scientific research, making sure that our supplements offer those same ingredients at the same clinically validated dosages. Unlike commercial manufacturers, we never choose our ingredients based on cost … so you can be sure you're getting the most nutritional potency for your dollar. Knowing where your supplements come from can be almost as important as what's in them. 99% of Life Extension products are made right here in the United States. The bottom line? Life Extension is the nutritional supplement brand you can trust with your health. *Based on ongoing customer surveys. **If you are not 100% satisfied with any purchase made directly from Life Extension®, just return your purchase within 12 months of original purchase date and we will either replace the product for you, credit your original payment method or credit your Life Extension account for the full amount of the original purchase price (less shipping and handling). Our focus is on quality, purity, potency. Shouldn't that be your focus, too? 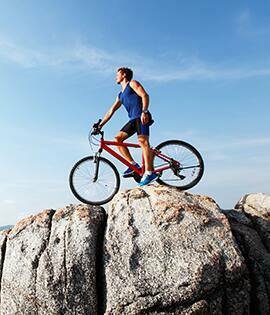 Quality: Making smart health choices begins with demanding excellence. You should know that we never accept anything less than the absolute best: our quality control standards have earned GMP (Good Manufacturing Practice) registration from NSF International — an independent organization that provides product manufacturing and testing standards for public health and the environment. Purity: We source only the best raw materials for our nutritional supplements. We only do business with the world's most reputable suppliers, and all raw materials are carefully processed to preserve chemical complexity. So you know that what's on our product label is what's in your supplement. Nothing more … and certainly nothing less … goes into your body. Unique formulations: Our innovative formulas are based on the latest research, but also something more … our passionate belief in a clinically validated, scientific approach to better nutrition. It's been the bedrock of our business for over 35 years. And our accumulated body of knowledge makes it possible for us to develop unique formulations you won't find anywhere else on the market. Simply put, unequaled experience leads to unmatched products. We purchase only the highest-quality materials for our supplements. But we go even further, verifying purity and potency using advanced analytical methods like high performance liquid chromatography and gas chromatography/mass spectrometry. We are consistently recognized for our outstanding purity and quality by ConsumerLab, an organization that provides information that helps consumers as well as health-care professionals identify the best quality health and nutrition products. We test our raw materials using US Pharmacopeia and other exacting standards. And we consistently seek out better state-of-the-art methods and procedures. This constant pursuit of the latest scientific processes puts our products light years ahead of everyone else. We don't just police ourselves, either. We often conduct reviews and evaluate the management procedures of outside providers, including both new and existing suppliers of raw materials destined for use in Life Extension nutritional supplements. At Life Extension, quality control continues even after our products are produced and packaged. We listen to our customers' feedback, and if we see an opportunity to improve a product or formula, we do so. All consumers are welcome to request a Certificate of Analysis for any of our products. These documents contain the results of rigorous quality control testing which show that our products meet specifications and contain the exact ingredients stated on our labels. Life Extension has been at the forefront of groundbreaking medical research for more than 35 years. We've also funded more than $175 million for anti-aging and disease research. That research is supported in part by your purchases. Yet another reason to feel good about choosing Life Extension. From revolutionary formulas to amazing breakthroughs, again and again, our commitment to health advances has made history. And many of the strategies we recommend are so advanced they are often 10 to 20 years ahead of mainstream medical acceptance. 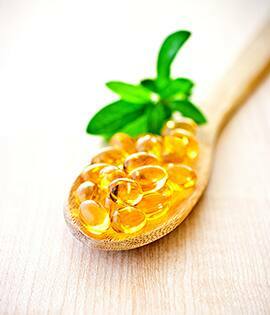 LE was the first to recommend the omega-3s in fish oil to promote heart health. Life Extension researched and recommended the daily use of low-dose aspirin to prevent vascular disease. Cardiologists now prescribe low-dose aspirin as standard protocol to protect against a heart attack in cardiac patients. Life Extension was the first to recommend coenzyme Q10 (CoQ10) as an anti-aging nutrient. Life Extension revealed the crucial importance of monitoring blood levels for fibrinogen, a risk factor for cardiovascular disease and stroke. Since then, numerous studies have confirmed high levels of fibrinogen as a risk factor — just like high cholesterol levels. Life Extension introduced the discovery of a compound called s-adenosyl-methionine (SAMe) that safely alleviated depression, arthritis, and certain liver disorders. Thirteen years later, in 2010, a Harvard study showed that the use of SAMe increased patient response to conventional anti-depressant drugs by 105%! The FDA approved the anti-viral drug ribavirin for use in hepatitis C patients. Life Extension had fought the FDA for 12 years to force them to approve this lifesaving medication. Life Extension conducted original research using carotid ultrasound tests to show that taking high doses of antioxidants over an extended period of time may provide some protection against atherosclerosis. Life Extension recommended memantine to treat Alzheimer's disease and Parkinson's disease. This drug had been used in Germany since 1991, but was not approved by the FDA. The FDA eventually approved it two-and-a-half years later. Life Extension introduced a form of coenzyme Q10 —ubiquinol — that is far better absorbed into the bloodstream compared to commercial ubiquinone CoQ10 supplements, facilitating greater cellular energy production. Life Extension stressed the benefits of pomegranate, resveratrol, and quercetin in enhancing a little-recognized blood enzyme called PON-1 (paraoxonase-1). PON-1 levels decrease with age, which leads to a decline in the cardio-protective effect of HDL (good cholesterol). Pomegranate has been shown to elevate PON-1 activity and promote activity in the gene that governs PON-1 production. Optimized levels of PON-1 have demonstrated the ability to block lipid peroxidation, and may serve as a potent defense against heart disease, metabolic syndrome, arthritis, and certain cancers. To help support healthy blood pressure, Life Extension formulated a product featuring oleuropein, a compound found in the olive leaf, which has been shown to favorably modulate arterial resistance or stiffness. Life Extension formulated a series of supplements containing the polyphenol gastrodin to support both cognitive function, circulatory function, and promote normal defensive and regenerative mechanisms in the brain. This innovative compound acts as a broad-spectrum "brain shield," protecting brain cells from oxidant, inflammatory, and excitatory damage. Life Extension created a specialized formula that supports adenosine monophosphate-activated protein kinase (AMPK) activation. Found in every cell, the AMPK enzyme serves as the body's master regulating switch. Studies show that increased AMPK activity revitalizes aging cells, promotes mitochondrial production, and even supports healthy lipid and blood glucose levels already within normal range. Life Extension introduced a formula containing concentrated pollen extracts specifically selected for their ability to promote prostate support, healthy urination patterns, and prostate function. In fact, we are much more than just a nutritional supplement company. We are much more than just a nutritional supplement company offering just nutritional supplements. We're your partners for an extended lifetime of good health. So we've developed a comprehensive system that integrates premium-quality products, lifesaving information, and invaluable services, all to help you stay healthy and live better. Don't just guess what your body needs. We offer our customers FREE access to an expert team of naturopaths, nutritionists, and nurses who can answer your health-related questions, every day of the year. And they'll gladly create a regimen of nutritional supplements, diet, and exercise that's customized for your needs. Bursting at the seams with the latest medical findings, research results, novel therapies, and innovative treatment protocols, Life Extension Magazine® is the ultimate resource on staying healthy and living better. Every month, it features the kind of hard-to-find, cutting-edge information empowering you to make wiser health choices … and become your own health advocate! Blood testing is the perfect way to begin building a supplement regimen that's just right for your particular needs. It provides you with vital information about your general health and nutritional status, enabling you to make informed health decisions and head off potential problems. What's more, annual testing is the true cornerstone of any comprehensive disease prevention program—it can actually save your life! That's why we offer our unique mail-order blood test service, with hundreds of blood tests, profiles, and comprehensive panels that can help you do everything from assess your cardiac risk factors, to determining what unseen factors may be contributing to unwanted weight gain. And they're all available at a fraction of what commercial blood labs charge!